A lifetime of wisdom and expertise is part of it. Authenticity, warmth and passion also help. But as any participant will tell you, Leslie’s classes are not only informative — they are fun. People come out feeling inspired. Leslie is the author of five cookbooks, including Gluten-Free Recipes for the Conscious Cook, Going Wild in the Kitchen and The Quick and Easy Organic Gourmet. She has developed recipes for leading food companies and been featured in dozens of media stories. 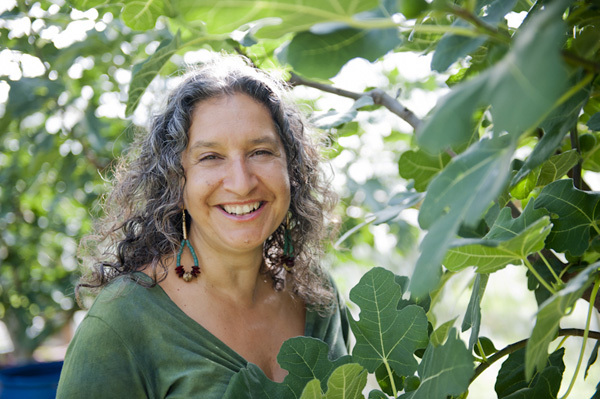 Her gift for translating potentially dull diets and ideas into a bounty of flavor and satisfaction has made her a leading authority on healthy food. Making great food isn’t magic, however. Behind every great chef is a great gadget. I sat down with Leslie recently to find out which whisks she can’t live without. STAINLESS STEEL: Stainless steel cookware  is light and versatile. The most important consideration is to use heavy-gauge pots, or at least pots with a heavy bottom. Because they conduct heat more slowly, you’re less likely to burn foods while cooking. They’re more expensive, but they’ll last a lifetime. Stainless steel is also Leslie’s first choice for ladles, tongs, pancake turners, measuring spoons and whisks. Choose wood and stainless steel for spatulas, stirring and serving spoons. Avoid the silicone or plastic-coated kitchen tools; they are not as strong and are made from chemicals. All-Clad and Calphalon are great choices. CAST-IRON: Cast-iron  is the original nonstick cookware. Griddles, pots and pans, and Dutch ovens cook food slowly and evenly. They also release small amounts of iron into the food, making it more nutritional. Some cast-iron cookware is enameled inside. These can be quite expensive, but again, they’ll last a lifetime. The enamel has the benefit of providing more of a nonstick surface without toxic chemicals. Lodge and Le Creuset are excellent choices. CERAMIC COOKWARE: Ceramic cookware  is attractive for cooking and serving. It conducts heat slowly, evenly and keeps foods warm for hours. However, some ceramic cookware produced in foreign countries may contain lead and other toxic chemicals. To be sure ceramic cookware is safe, make sure it’s made in the United States or Canada. It is fun to buy directly from potters at craft fairs and their local shops. You should ask them about their glazes, and make sure they are lead-free. Emile Henry Chantal and are both strong brands. GLASS COOKWARE: Glass cookware re retains heat for a long time and offers the advantage of allowing the cook to watch foods cook and bake inside. Leslie prefers glass measuring cups, too. CorningWare SimplyLite glass bakeware is top quality. Pyrex is also a good choice. WOODEN CUTTING BOARDS: Wooden cutting boards are preferable. Keep them in good condition with a fine mineral oil. Cutting Board USA makes all their cutting boards in the USA from FSC approved hardwood. Plus they have a custom laser engraving option for special messages. Red Onion Woodworks makes handcrafted natural edge boards from salvaged wood — gorgeous! 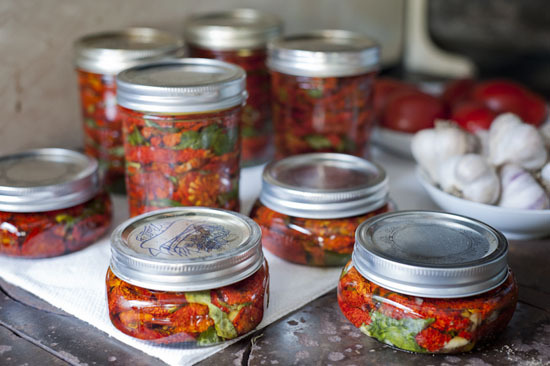 GLASS JARS: Glass jars are great for storing grains and beans on open kitchen shelves. Leslie uses glass and bamboo to store salt crystals. She stores leftovers in glass jars in the refrigerator, too. Plus, glass is earth-friendly. Leslie likes to collect jars but you can also buy storage jars made from recycled glass like these pretty Nkuku Shamala Jars. CERAMIC CUTTING TOOLS: Ceramic knives, peelers, graters, and mandolins are light weight, and always sharp, and they’re easy to clean because they don’t absorb food elements. Kyocera makes a wide range of excellent ceramic cutting tools. 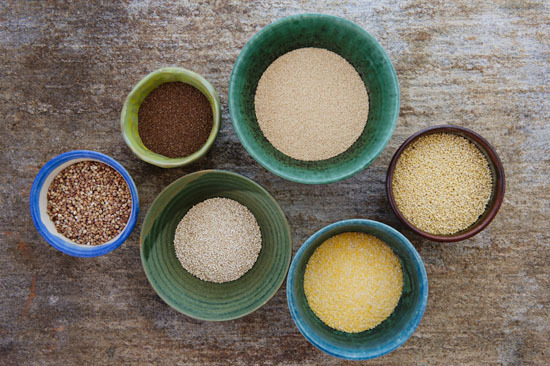 A well-stocked healthy gourmet kitchen includes a diverse array of organic grains such as the beautiful and delicious teff, kasha, millet, corn grits, quinoa and amaranth pictured above. Bob’s Red Mill offers a wide variety of whole grains and whole grain flours, including gluten-free products: whole grains, flakes, flours, nut flours. Frontier Natural Products Coop has a full line of fair trade, certified organic dried herbs, spices, vanilla and other flavored extracts, flax seeds, sea vegetables. Lotus Foods focuses on exquisite exotic heirloom varieties of organic certified rice, grown all around the world. Maine Coast Sea Vegetables has wonderful, wild-harvested, organic-certified sea vegetables, such as dulse, smoked dulse, digitata (kombu), kelp, laver (wild nori), alaria, sea vegetable snacks and seasonings (dulse/garlic, kelp/cayenne, and more). Navitas Naturals is an excellent, reliable source for gourmet-quality organic cacao butter, cacao paste, cacao powder, cacao nibs, goji berries, maca powder, coconut oil, hempseeds. Nutiva products include organic hemp seeds, organic hemp oil, organic extra virgin coconut oil. Selina Naturally has sustainably produced Celtic, Hawaiian and Portuguese sea salts, and many other great organic products, such as olive oil, ghee, nut and seed butters. Shiloh Farms offers a full line of organic grains, beans, dried fruits, nuts, seeds, sweeteners. South River Miso has superb organic mellow and aged misos made from brown rice, millet, barley, chickpeas and adzuki beans; also, dandelion leek, garlic red pepper and sweet white miso.